There are four Gandhis who have survived Mohandas Karamchand Gandhi’s death. Fifty years after Gandhi’s (1861-1948) assassination, it may be useful to establish their identities, as the British police might have done in the high noon of colonialism. All the four Gandhis are troublesome, but they trouble different people for different reasons and in different ways. They are also useable in contemporary public life in four distinct ways. I say this not in sorrow, but in admiration. For the ability to disturb people — or, for that matter, be useable — one hundred and thirty years after one’s birth and fifty years after one’s death is no mean achievement. Frankly, I do not care who the real Gandhi was or is. Let academics debate that momentous issue. Contemporary politics is not about ‘truths’ of history; it is about remembered pasts and the problems of fashioning a future based on collective memories. For better or for worse, Gandhi seems to have entered that memory. Two qualifications at the beginning. First, I am no Gandhian. My opinion should not count but Gandhism, as I understand it, is greater than Gandhi was. Gandhi himself more or less admitted so, when he gave the entire credit for his ideas to ancient wisdom, and he is certainly not diminished by that admission. Actually, he comes off as more human and, for that matter, more self-reflexive. Gandhi could not live up to his principles partly because he was a practical politician, and the job of politics is to dilute ideological and moral purism. To use my favourite commendation, borrowed from the obituary written on him by Arnold Toynbee, Gandhi was one prophet who was willing to live in the slum of politics. He could not afford to be a perfect Gandhian. It is a tribute to his memory when one calls him an imperfect Gandhian. Second, I should clarify for the sake of the incurably scholarly that the Gandhis I discuss are all Weberian ideal types. They are tools of analysis and at places — this Max Weber did not bargain for — caricatures. That means they are unreal but not untrue. In this respect, I have been influenced by literary theorist D. R. Nagaraj who loved to claim, following William Blake, that stylised exaggeration could be a pathway to wisdom. Now, the surviving Gandhis. All of them are well known. I am merely bringing to awareness tacit knowledge. However, it is my responsibility as a psychologist to register the warning that the knowledge that exists and is tacit is often the most disturbing and the most painful to own up. The first Gandhi is the Gandhi of the Indian State and Indian nationalism. I find this Gandhi difficult to gulp and so would have, I believe, Gandhi himself. But many people find only this Gandhi tolerable and live happily with him. The biography and political career of this official Gandhi began early. After Independence, the political presence of the Father of the Nation, his memory and his writings were proving very problematic to the functionaries of the young Indian state and to intellectuals who had already begun to specialise in hovering, like so many flies, over the State’s patronage-structure. Not merely the strong anarchist strand in his ideology, but even his peculiar denial of clear-cut divisions between the private and the public, the religious and the secular, and the past and the present, were proving to be a real headache. These intellectuals were as disturbed by him as his assassin was. Nathuram Godse, a self avowed rationalist and modernist, in his last statement in the court that sentenced him to death explicitly claimed he had committed a patricide to save the nascent Indian State from an anti-modern, political neophyte and a lunatic. 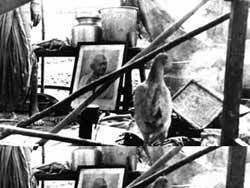 After independence, Gandhi’s own associates would have liked to bury Gandhi six feet under the ground, while keeping his image intact as an icon of the Indian nation-state. Not because they disliked Gandhi, but because he looked such an anachronism in the post-World War II atmosphere of centralised states, social engineering and ‘realist’ international politics. Since then, Indian statists of both the right and the left have never acknowledged their enormous debt to Mr Nathuram Godse for imposing on the Father of the Nation a premature martyrdom that straightaway gave him a saintly status and effectively finished him off as a live political presence. Their brainchildren still hold it against Gandhi that he has occasionally refused to oblige them and has defied the saintliness imposed on him, presumably as a strategic means of neutralising him. He would have certainly differed fundamentally from his gifted grandson, philosopher Ramchandra Gandhi on this issue. This is the Gandhi, we the residents of the imperial city of Delhi are once in a while told, who is about to be ensconced on the pedestal vacated by King George V at India Gate. It will probably be his final coronation as the patron saint of India’s creaky First Republic. It will also be the most comic use of Gandhi since that middleclass, tragic, romantic hero, Subhash Chandra Bose, named one of the brigades of the Indian National Army after Gandhi during the final days of World War II. With the declining status of the Indian state and with various westernised versions of Indian nationalism sprouting like so many mushrooms around us under the guise of cultural self affirmation, this Gandhi is presently not in the best of health. What the late Mr Godse could not do to him, the Hindutva brigade and the two Bombay film buffs turned potency-driven flag-bearers of Hindu nationalism, Bal Thackeray and Lal Krishna Advani, between them have already managed to do through the Babri mosque episode. The second Gandhi is the Gandhi of the Gandhians. He is at the moment suffering from an acute case of anaemia. The Gandhians’ Gandhi is occasionally quite loveable and has a grandfatherly, benign presence in the Indian public lore. But he is often a crushing bore, apart from being a Victorian puritan mistakenly born in India. He drinks Nimbupani — unlike the Gandhi of the Indian state and nationalism who drinks Indian made Campa Cola, technically made by an Indian company, but not Coca Cola, made by a multinational corporation — and wears home-made khadi. One thing the second Gandhi does not do. He does not touch politics. In fact, he cannot touch politics, lest the subsidy and grants from the Government of India to the various Ashrams named after him, to hand-spun khadi, and to the ritual seminars on Gandhism dry up. He does occasionally, in this incarnation, convene meetings to condemn the growing criminalisation of politics, uneven development or corruption in the country. In these seminars everybody sheds bountiful tears about the state of affairs in India without naming any names and without mentioning any party. Everyone is happy after the event; even the corrupt politicians who have criminal connections lustily join in the applause. The Gandhi of Gandhians travels all over the world to preach Gandhism or lecture on Gandhian thought. He speaks through the Gandhians to the public in India much less frequently. Rightly so, because in India his audience is usually pathetically small. And even that small audience frequently looks sleepy, inattentive and tired at the beginning of the sermons. They come because they expect to be seen and because it would not look good if they are absent. The average age of such Gandhians is at the moment about to touch hundred and the average age of the listeners not much behind. The Gandhians feel that this is because Indian people have failed Gandhi. Others less respectful towards such Gandhians feel that actually the Gandhians have failed both the Indian people and Gandhi. They point out that those who swear by Gandhi day and night could have walked another kind of road, as the likes of Baba Amte, Anna Hazare and Sunderlal Bahuguna have done. The third Gandhi is the Gandhi of the ragamuffins, eccentrics and the unpredictable. This Gandhi is more hostile to Coca-Cola than to Scotch whisky and considers the local versions of Coca-Cola more dangerous than imported ones. This is because his objection to highly mechanised fast foods is structural and, therefore, he considers it more dangerous if, on nationalist grounds, long-lasting, deep-rooted Indian structures are created to produce superfluous items of mass consumption within the Indian economy. And he says so in so many words. Not given to bogus nationalism, he would rather import Coca-Cola and Pepsi Cola, for those Indians who cannot live without them, than underwrite Campa Cola. This Gandhi — vintage Hind Swaraj — is also bit of a nag and a spoilt-sport. He loves to be a maverick and an oddity in our public life. It is this Gandhi Vandana Shiva had in mind, whether she knew it or not, when she filed a suit in an American court against the patenting of some derivatives of neem. It is this Gandhi who has guided the notorious agitation of Medha Patkar against the Narmada dam, Claude Alvares against Operation Flood, and Vandana Shiva against the Green Revolution. And it is this Gandhi who lived in the writer-dancer-thinker Shivaram Karanth who in his late eighties took on the deceit, stupidity and necrophilia of India’s nuclear establishment. This Gandhi has other subversive affiliations, too. He prefers the company of known critics of his worldview like V. M. Tarkunde and even Pakistanis like Asma Jehangir to the company of those who claim to bear his name and have had the run of Indian politics for more than two decades. The average age of those who keep the company of this Gandhi is low, but it would have been lower, but for some young-at-heart like Tarkunde and Kuldip Nayar who push it up inconsiderately. And both this Gandhi and his young friends are a real nuisance to the Indian State, to the country’s officially defined security interests, and scientific establishment. They are a menace to the common sense that passes as sanity but can be actually called, adapting an expression used by my erstwhile guru, Sigmund Freud, psychopathology of everyday public life. I have a personal stake in this Gandhi and his terribly irresponsible young friends. Many of the things I have done in my life these youngsters are now doing better. The party of the ragamuffins is growing in strength. To spite my numerous enemies I can even say that, even after my death, what I am saying and doing will be said and done more aggressively, confidently, elegantly and with greater political finesse by them. This thrills me, for even after my death, I should be able to haunt my enemies who survive me. Incidentally, this Gandhi does not have to wear khadi or abjure alcohol. His usual dress is blue jeans and khadi kurta and, to please journalist Raminder Singh who wrote about it with great relish in India Today, he also carries a jhola. Many suspect that this Gandhi has now very tenuous links with his birthplace, Gujarat, and that he may disown the state as one that has disowned him. I am afraid this Gandhi and the evil company he keeps are going to be a real pain in the neck for the sane, rational, well-educated Indians in the coming decades. Anthropologist and political activist Fred Chiu of Taiwan, frequently reminds me of the old saying that wherever civilisation goes, it takes with it syphilis. He claims that nowadays wherever global capitalism goes, it takes with it political activism, NGOs and, presumably, the jholawalas who at the first opportunity begin to harass heroic corporate investors and captains of industry. This, the votaries of global capitalism and the business tycoons are tearfully coming to realise, is an unmentionable hidden cost of capitalism. Frankly, I have secret admiration for the gumption of those who extract this cost. The fourth Gandhi is usually not read. He is only heard, often second- or third-hand. While a few like Martin Luther King carefully and critically assess and use his work, the rest do not even know what he wrote. Nor do they care to. Their attitude to Gandhi is similar to that of the late A. K. Gopalan to Karl Marx. He reportedly once said that he had not read any Marx because he would not have understood him, but he remained a Marxist nonetheless. This Gandhi is primarily a mythic Gandhi. Unlike in real life, he conforms fully to his own tenets — at least according to his admirers in the environmental, antinuclear and feminist movements. For, the ‘realities’ of his life are derived from the principles of Gandhism as they have spread throughout the world as a new legend or epic. Some year ago, an American columnist, Richard Grenier, taken aback by the immense popularity of Richard Attenborough’s Gandhi, tried to debunk Gandhi by pointing out major discrepancies between Gandhi’s life and philosophy. (Grenier of course did not have anything to say about whether he rejected Milton and Beethoven because they had a record of child abuse or Plato because he justified it in the context of homosexuality.) But such attempts at demystification do not work because the Greniers of the world confront the need to believe in human potentialities and a curious compulsion to intercede in situations of manmade suffering that often seems basic to human nature. authoritarianism backed by the power of the state and modern technology. For above all, this Gandhi is a symbol of those struggling against injustice, while trying to retain their humanity even when faced with unqualified inhumanity. That is why when Benito Aquino of Philippines was assassinated, the demonstrators on the streets of Manila did exactly what the Polish labourers at Gdansk did. They shouted ‘Benito, our Gandhi,’ and if this seems only a coincidence, the Burmese students who rose against their military rgime some years ago also invoked Gandhi in the same way. Only their leader this time was Aung San Suu Kyi, who had not read Gandhi when she began to be thoughtlessly accused of being an uncompromising Gandhian. At different times, this epithet has fitted different people — from Khan Abdul Gaffar Khan to Nelson Mandela. The fourth Gandhi walks the mean streets of the world threatening the status quo and pompous, glib bullies everywhere and in every area of life. The tyrants undervalue him, because he has no arms to back him up and the professional revolutionaries make fun of him because he talks of nonviolence. But both usually pay heavily for this under-estimation. In the long term, the former can only take solace from the fact that sometimes the intended revolution against them fails, paradoxically after succeeding spectacularly. Revolutions, whoever does not know, eat up their children both physically and morally. 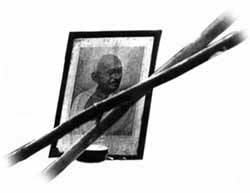 The revolutionaries — nowadays usually a motley crowd of middle-aged, armchaired, cynical academics, past their prime and enjoying sinecures in the universities — can take solace from the fact that they can hold ponderous seminars on the ‘historical’ limits of Gandhism that should have ensured its death decades ago. But, by the time the seminar ends as a resounding academic success, this mythic Gandhi has moved on to other slums of the world to lead new formations against his erstwhile proteges. I have given you four Gandhis and indicated my preferences, so that you can make your choice. But then, you do not have to choose any of the four. Perhaps that will be the wisest course. For Gandhi can be dangerous. It is much better for you to hang his portrait in your office or home, like many others do, to show your respect to this new addition to the Indian pantheon, and then take your children to a picnic on the public holiday that his birthday has become.